I could wax poetic, except I’m an unexceptional poet. I could philosophize, except I’m an unexceptional philosopher. I could spout theology, except I’m an unexceptional theologian. I’m even an unexceptional photographer–it’s especially difficult to take pictures of walls that aren’t there any longer. Wikipedia tells me that the word wall is from the Old English word weall and it is a vertical structure, usually solid, that defines and sometimes protects an area. In fact, if walls divide and separate us, I could discuss the new trend in houses that opens up kitchens to the living areas of a house. So do we want an undefined and unprotected kitchen? Yes. Two points are especially important here: 1. We don’t, technically, live in a bungalow. 2. We didn’t hire an architect. 1. We don’t technically live in a bungalow. 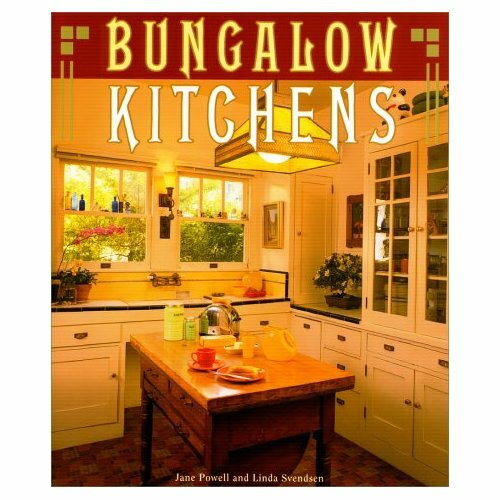 Although it was built around the time of many bungalows, and it might fit the definition, as in being one story and a modest, affordable dwelling, it has no architectural presence. There’s nothing that makes it stand out except maybe the clipped gables (also called jerkinhead gables–I don’t know where to start with that one, so I think I’ll leave it alone…) No beautiful woodwork, no congruency–as Dad said, “Well, that house grew like Topsy…” (from Uncle Tom’s Cabin by Harriet Beecher Stowe). The closest the cottage gets to architectural charm is a couple of built-in cupboards and a big brick chimney, all of which we are taking great pains to keep. The outside of the houses look similar, but the floor plans don’t match. 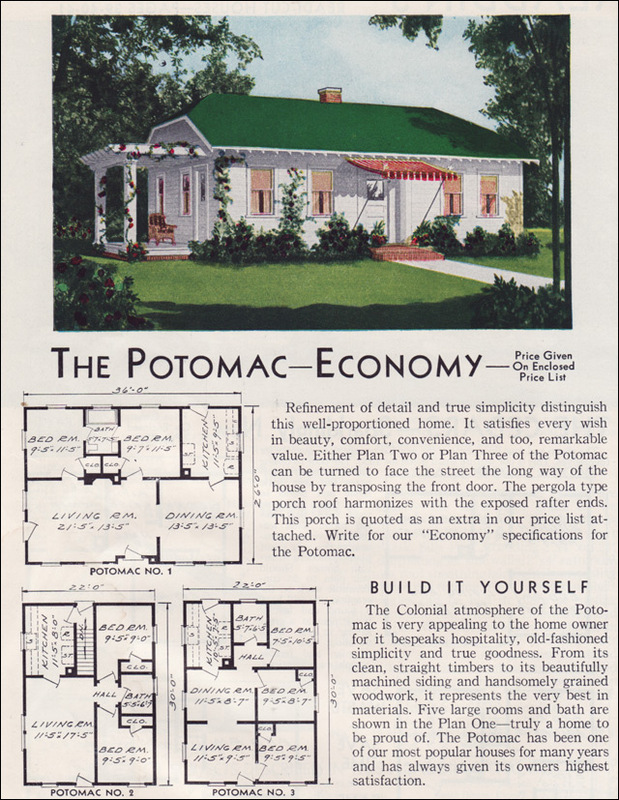 I did find a lovely rendering of an Aladdin kit house that was sold between 1949 and 1951 called the Potomac. It was an Economy house and sold for around $1500-$2000, depending on whether you bought the pergola porch. The houses look remarkably similar. I’d like to use this as inspiration for what the house should look like on the outside when we are finished. Yahoo notes that, “The most important thing to do before tearing down a wall is to determine if the wall is structurally necessary.” Mr. H.C. is an expert on whether walls are structurally necessary or not. Daughter Maggie can attest to that! She hired a contractor who took out a structural wall. We happened to be visiting a week or so later. Mr.H.C. took a couple of looks and then they sped to Home Depot to buy studs to support the spot where the wall had been taken out. Then they had to hire a structural engineer to figure out what to do next. THAT contractor was sorry! 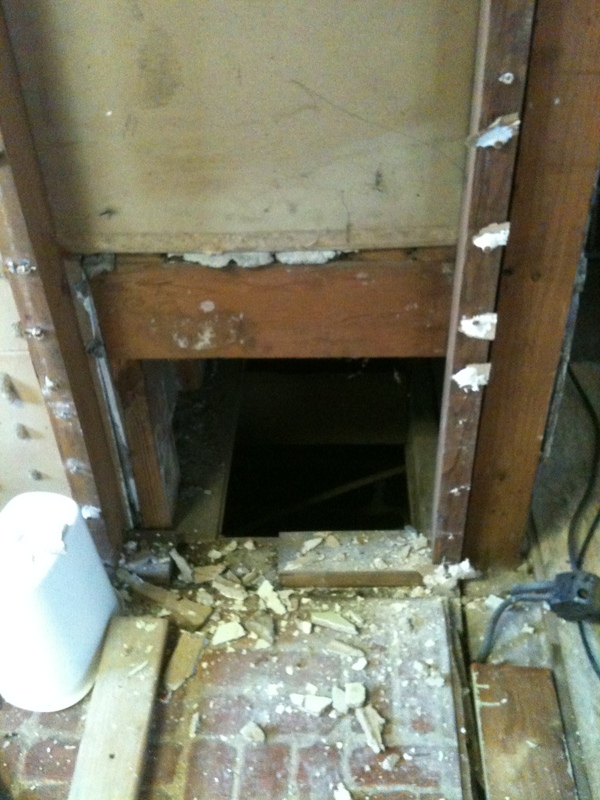 So Mr. H.C. climbed up into the crawl space above our bathroom, dodging cobwebs and spiders and checked out which way the joists and rafters run. Turns out to be safe to tear ’em down. Full Speed Ahead: Open up the room; Let in the light; Make the kitchen bigger; Cook with your friends! Walls are human made things. There is nothing (that I can think of) in the natural world–in God’s creation–that was the prototype for a wall. They were made to define, to protect, to separate, to divide…. That’s not to say I’m totally against walls — walls around a bathroom are a fine idea :-) — but mostly God wants the walls around us gone. It’s scary taking down walls. What if you take a support wall down and the structure starts to crumble? What if you expose what’s underneath? Let me tell you, it’s guaranteed to be ugly and it’s also guaranteed to be hard work, and there will be surprises. So why even try? 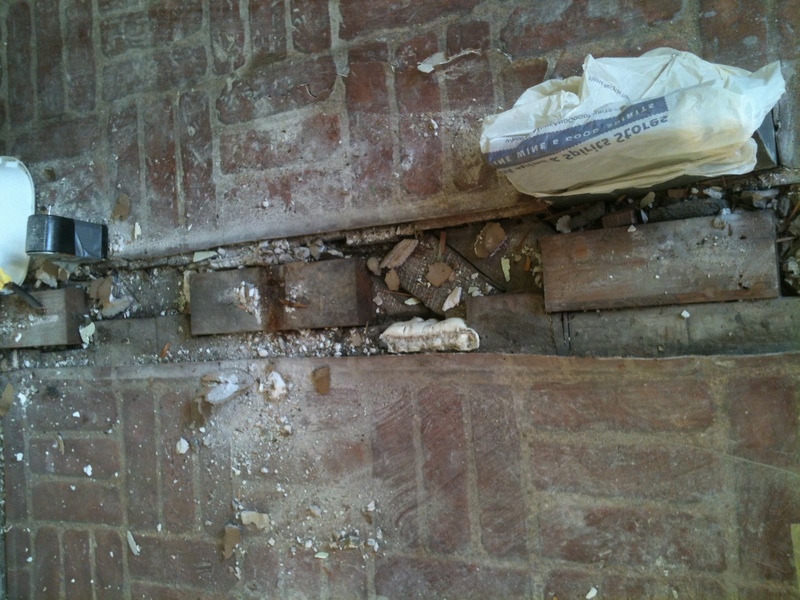 This is a picture of the floor where the wall was–yep, it’s ugly! Why try? Because when that wall is down, it opens up the room that is your heart; it makes the room bigger; it lets light into your life; it allows for true relationships, both with people and with God. So Full Speed Ahead, let the walls come crashing down! No it isn’t exactly elves. 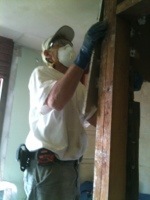 Here is Mr. H.C. taking out a piece of the wall. (We actually took out pieces of three walls.) 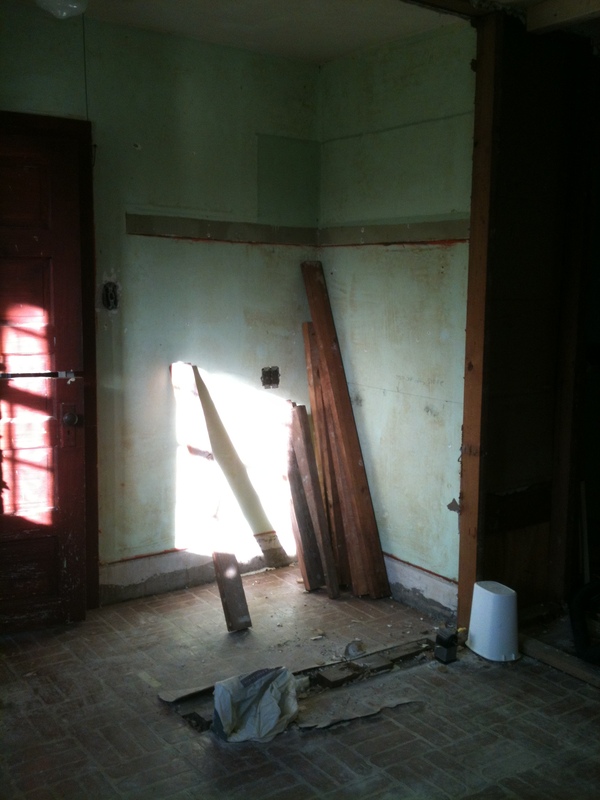 It wasn’t wood lath and plaster, which is what most people think of as old, dusty plaster. 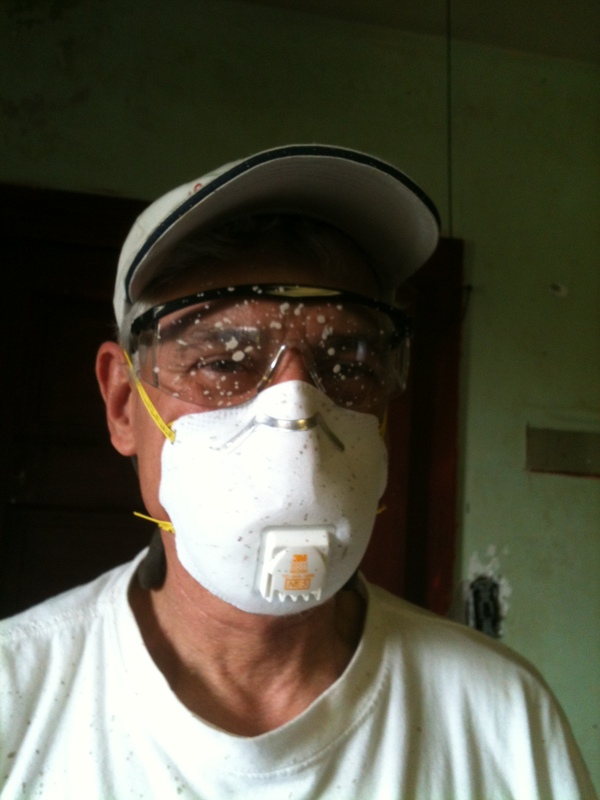 This was plaster board coated with plaster. Mostly it came down in chunks. We researched it (it’s organic); tested the paint (no lead); and then wheelbarrowed it down to the hillside and tossed it over. We’ve since covered most of it with dirt and weeds, although I must admit, it was hard to throw those first few pieces. It just didn’t seem ‘green’. (But neither is Wasp Killer or Mole-Away…) Just think of it as fill.